Sixth historical collaboration from the Ungers (LBJ, 1999, etc. ): a scattershot group portrait of the Jewish-American dynasty that included major industrialists and patrons of the arts. The book’s first and better half chronicles the Guggenheims’ origins in Switzerland and their accumulation of substantial wealth from silver, copper, and other valuable ores after patriarch Meyer Guggenheim emigrated in 1848 to America. Meyer got the family into the mining and smelting business, insisting that all seven of his sons share equally in the responsibilities and rewards. Second son Daniel kept the fortune growing, and, by the standards of the time, the Guggenheims were humane employers, not only in the western US but also in Mexico and Chile. 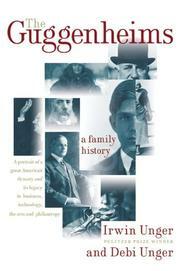 As Daniel’s son Harry moved the family into aviation, publishing and philanthropy, the narrative loses its focus, attempting to cover too many relatives with widely divergent interests over several generations—a family tree is sorely missed. Daniel’s younger brother Solomon and niece Peggy were pioneering advocates of modern art, and the Ungers capably sketch the pair’s achievements without adding anything new to their biographies or to our understanding of their relationship with other Guggenheims. A plethora of further descendants with different last names (offspring of those neglected daughters) also get the thumbnail-sketch treatment, including Harold Loeb (model for the anti-Semitic caricature in The Sun Also Rises) and book publisher Roger Straus Jr. among those about whom we don’t learn much new. The Ungers fail to give a sense of what the family dynamic was, other than being hard on girls, and it’s particularly unsatisfying that they never address the question of why so many of the Guggenheims were married and divorced multiple times. Decent background on mining and other aspects of American society and industry early in the 20th century, but lacking a coherent thread to make sense of the Guggenheims’ relationship to their nation or to each other.